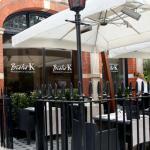 Bistro K is a new French restaurant and lounge right in the heart of South Kensington. Representing everything that’s best in contemporary French style, their head Chef, Armand Sablon creates delicious dishes using the finest ingredients whilst making sure that their prices are affordable. This is relatively unusual for an area where dining out tends to be exorbitant. The restaurant is spacious and airy and the perfect place to relax and enjoy a long lunch or dinner. They can comfortably seat up to 90 people and they also have a bar and lounge area where you can enjoy sophisticated cocktails, fine spirits as well as tapas. Downstairs, you will find a truly spectacular Cellar Room for private dining, entirely surrounded by glass-panelled walls through which you can see hundreds of exclusive wines. It really makes for an unforgettable private dining experience and is available for any occasion, whether it is business, breakfast, a relaxed lunch or a formal dinner. They also have a terrace for alfresco dining in the summer. They offer excellent French cuisine and their dishes are delicious yet not overly complicated. They source all their ingredients locally where possible, and combine them with the distinguished French style to create a fantastic menu all year round. Lunch - £12 for two courses and £15 for three courses excluding wine. Dinner - £25 for three courses, excl. drinks not included. The bar, whose accent is on informality, offers tapas and other exciting appetizers from Irish Native Oysters to a selection of artisanal cheeses, Foie Gras au torchon and Tempura Prawns with Chilli Jam. Bistro K proposes as well a Sunday Brunch at £25 including 2 salt plates and 2 sweet plates. Tuesday to Saturday from 9.00am to 10.30pm and Sundays for brunch.